We all know that bullying happens anywhere, anytime. It also happens to anyone and in many different ways. 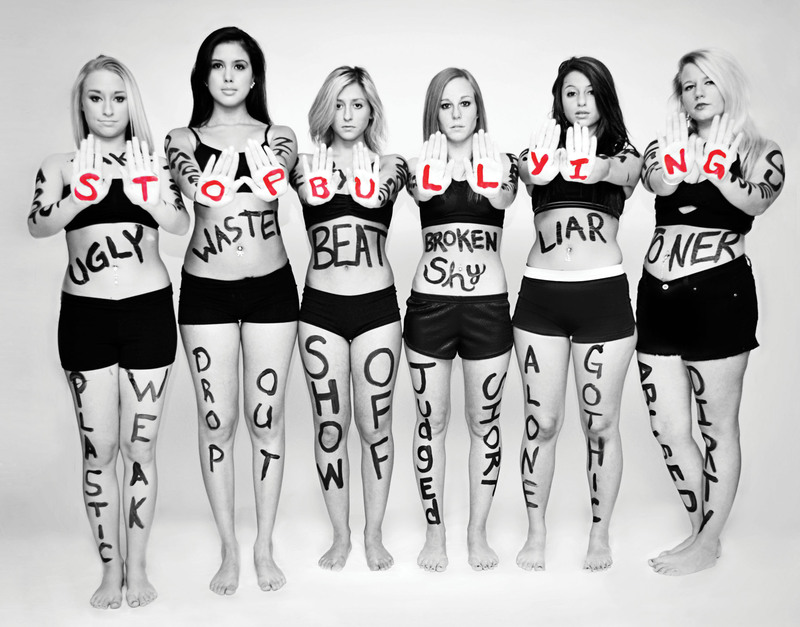 Many people have personal stories of being bullied and all the challenges that can come along with it. I spent the better part of my elementary and high school years being bullied by a small, but at the time, powerful group of kids. I remember eating my lunch one day with my friend Erin, sitting behind the teacher’s desk. This group of kids came in and they were talking about me. They were talking about how I would never amount to anything; I was going to be miserable my whole life and I would never get out of the small town I lived in. I remember thinking in that moment that they must be right because they are the cool kids, what did I know. I remember looking at my friend Erin and thinking my life will never be the same. There was the time I was invited to go shopping and left standing at the meeting spot. There was the cruel joke played on me at the Grade 6 dance and countless other instances where I was reminded on a regular basis how worthless I was. I coped with this by eating. I remember taking in and believing to my core that what these kids were saying was true. I turned into a teacher’s pet. I would do things in the office or other classroom’s at lunch and recess to avoiding being around other kids. When I became friends with other girls I was usually the “doormat” and was treated pretty poorly by some people that called themselves “my friend.” So I ate. I ate to stuff the emotions of feeling worthless deep down inside. My weight for me has been all about protection. If I am overweight then people don’t want to be my friend or don’t want to date me because I am the “fat girl.” I can avoid ever feeling the feelings I felt in school by keeping myself safe and protected. To this day, I battle those feelings. I have done a lot of work personally to move past those feelings and repair the damage I have done to my body as a result. I know that this is not a process that will happen overnight and I am very thankful that I have the amazing friends and family that I do have in my life now! It’s funny, I was asked the other day if I would go back and change anything in my life. My response was no, because everything I went through in life has lead me to grow and be the woman I am today, which I think is pretty awesome. Those kids don’t define me anymore and I believe that each person has a uniqueness that makes them who they are. Embrace what is unique, weird and different about you, because that is what makes you who you are. Don’t ever hide or shy away from that. If you are a victim of bullying, don’t tolerate it, don’t believe what they tell you and don’t be afraid to do something about it. Never miss the opportunity to make a difference. The one that fit perfectly! You can Google “Weight loss motivations tips” and 2.3 million results pop up. How do I know this? I did it and I scrolled through and read a handful of them, on many different occasions. I have become a firm believer in that motivation needs to come from the inside, not some external source. If you are taking on your health and fitness for you, there are mountains of statistics that say you will be far more successful than if you are doing it for someone/something else. The other night though, I fell in love and decided to re-evaluate. It’s been awhile since I have ventured out in public with being a carrier of, what feels like, the plague for most of February. I walked into a store and I instantly fell in love with this dress. Those that know me know I do not wear dresses. Special occasions, maybe, but being plus size I just never felt comfortable in them. However, this dress was a game changer for me. It was one of those dresses that I see in a magazine, cut it out and stick it in the “when I finally lose the weight” pile. The closer I got to the dress on the rack the more I fell in love. The color, the pleats, the fabric and the closer I got I saw the sale sign and then I saw that there were only 2 left! One was in my size and one was 2 sizes down. I tried on the one that was my size and instantly fell in love. I stepped out of the fitting room to check in the 3-way mirror and some other ladies commented right away. I could feel my cheeks changing color. I knew I was going to get the dress. Then this little thought entered my head. “Get the one that is two sizes smaller, as a goal.” Now as someone that has repeatedly ignored that little voice in my head and smacked myself later for it, I went to the rack and it was gone. I was sad and was walking around the store contemplating whether to get the dress or not. A sales associate that was helping me in the fitting room told me that the woman, who was trying on the size I wanted, wanted to try on the size I was holding. It was a war of the dresses now! After 15 minutes of negotiations we traded dresses, much to the amusement of the store staff. I marched off to the cashier before she could change her mind again and this is where I knew it was fate. The original retail on the dress was over $200 and I got it for $40! I am now in possession of a dress that is 2 sizes to small and with an office full of over 300 doughnuts and goodies this morning it has never felt easier to walk away because I am going to wear that dress! So this month has not gone according to plan AT ALL. I got in one fitness challenge class on Feb. 2 before being smacked with what has probably been the worst bout of illness since….I can’t remember when. I had the flu, a strep infection, and a minor ear infection. After experiencing complications with the antibiotics and being in and out of the doctors, numerous tests, two weeks later I was finally starting to feel human again, only to come down with a horrible 24 hour tummy bug. One day of reprieve and I now am starting to get a cold! I get it, my immune system is shot! Oi! This was not how I envisioned this month going. I find it entertaining how when you finally go to take a step forward in life, the universe finds a way to test your commitment. Well test away universe, I will not waiver! On the bright side, this illness has brought on a serious (but unintentional) refined sugar detox, an increase in fluid intake, which I am having to maintain illness to illness. You know what they say “21 repetitions makes a new habit“, well I am on day 21! With being so ill, not having the appetite or desire to eat has made it easy to choose healthier alternatives to my normal comfort “sick” foods. So…game on Universe, bring it! I look forward to the day very soon when I can return to not relying on cold/flu medication to get me through the day and all these horrible antibiotics and drugs have left my system. If anyone has any ideas on how to rebuild your immune system I am open to hearing them! I know there is a nasty flu flying around right now. I can seem everyone posting about it in my Facebook newsfeed. So get plenty of rest, eat healthy and take lots of Vitamin C and Echinacea! Be Well!